Getty/Bryan BedderEvan Spiegel, CEO of Snap, which held an extremely abbreviated annual meeting on Thursday. 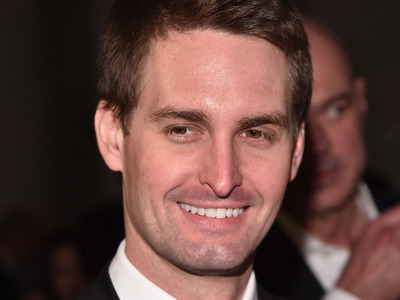 The duration and format of the meeting demonstrated CEO Evan Spiegel’s control over the company. Evan Spiegel just demonstrated another one of the great perks of being king – short meetings that you don’t even have to attend in person. Spiegel’s company, Snap, held its annual shareholder meeting on Thursday afternoon. While such affairs can be long, drawn out, and contentious, that wasn’t the case here. Snap’s was held online, and – lacking the typical management presentation and question-and-answer period with shareholders – it lasted less than three minutes. There’s a reason for that. Thanks to Snap’s stock structure, those everyday stockholders with Class A shares have absolutely no voting power. So, they get no say in setting the agenda for Snap’s annual meeting, much less directing its policies or determining its leadership. Instead, the only people who have say over those matters are the insiders and early investors who hold Snap’s Class B stock, which get 1 vote per share, and Class C stock, which get 10 votes per share. Nearly all of the Class C shares are held by Spiegel and cofounder Robert Murphy. Thanks to that, between the two of them, they control nearly 94% of the votes at the company. That gives them the power to do whatever they want at the company’s annual meeting. In this case, they limited it to two agenda items – reelecting Snap’s board, and reappointing Ernst & Young as its auditor. Needless to say, both items passed. And they did so apparently without either Spiegel or Murphy actually participating in the meeting or interacting with shareholders. Although Spiegel and Murphy were reportedly on the call, the only person who spoke on it was Atul Porwal, Snap’s associate general counsel. And he was done after 2 minutes and 46 seconds. To be fair, Porwal did say the company hadn’t received any questions from stockholders. One might think that with the company still trading well below its initial public offering price, still posting large losses, and coming under increasing pressure from Facebook’s Instagram, investors might have been more inquisitive about its direction and leadership. But it’s possible that everyday investors were stymied by the form of the meeting – a streaming webcast, which didn’t provide them a way to interject with a question should one have come to mind during its duration. One other bonus of giving regular shareholders no votes: Snap didn’t even have to send out the typical proxy statement to solicit votes from them or detail shareholder proposals. Instead, it only sent out an information statement that described the two proposals and gave a brief list of questions and answers about the meeting.